Last weekend I made two dips for a party: one high brow and one low brow. I love both so I’m sharing them with you! 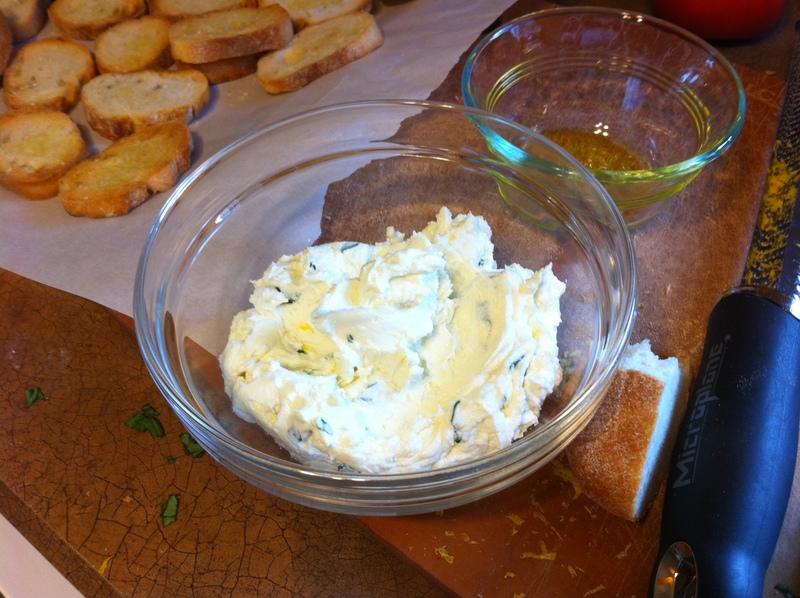 The first is a goat cheese and ricotta dip from Giada de Laurentiis. Don’t be scared by goat cheese – it’s good. My friend Erin served this at her apartment and I was hooked. I’ve made it three times since then. And that was only last month. Preheat the broiler in your oven and place a rack a few inches (maybe 4?) away from the flame. Slice the baguette into 1/2 inch thick slices and arrange on a baking sheet. 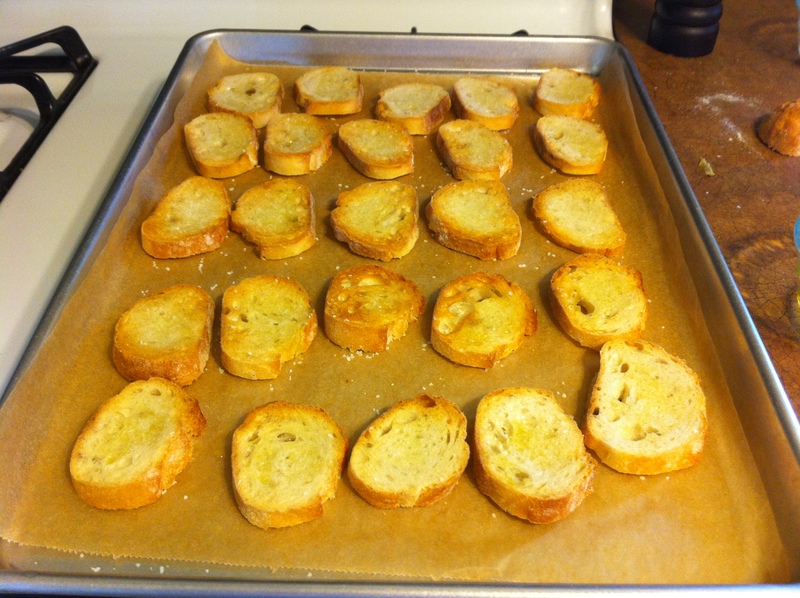 Brush both sides of the bread with olive oil and sprinkle with kosher salt. Broil until the bread is just browning, remove from the oven, and flip. Broil the other side until just brown. WARNING: Watch the bread carefully -it cooks quickly! 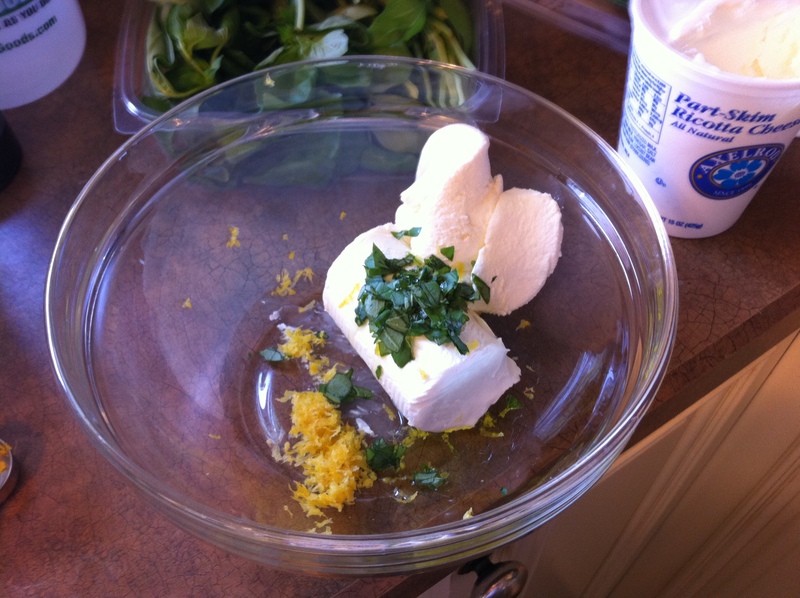 Combine the goat cheese, ricotta, lemon zest and juice, basil, olive oil and a pinch of salt and pepper. Stir well to combine. You can leave the dip in a bowl and serve with the bread, or you can spread a little dip on each crostini and serve it that way. Ready for the low-brow dip? I have no pictures because I was rushed as hell when I made it. In a large dish (I used a Corningware oval dish), spread the refried beans across the bottom. In a separate bowl, combine the minced onions with the three avocados and mash together until it’s combined but still chunky. Spread that across the refried beans. Spread the sour cream over the avocado. Add the tomatoes, between 1/4 and 1/2 cup of salsa, and the cheese. Enjoy with some tortilla chips!